For once, an entire nation held its collective breath for a win in a sport other than cricket. Mary Kom, the lone woman boxer from India took on Nicola Adams in the semi-finals of the inaugural event at the London Olympics a while ago but lost the bout. And when the nation let out its bated breath, it was not in disappointment. For though she had not brought home the gold, she had made sure of a medal on Sunday with the victory over her Tunisian opponent Maroua Rahali, in a lop-sided quarter final match. It was the birthday of her twins Rechungvar and Khupneivar that day. What better birthday gift than that radiant smile and a medal for the country? Gritty Mary had almost missed her date with Olympics by losing in the Quarter Finals of the World Championships, which was the qualifier for the big Games earlier this year. But when she managed a spot finally — she is the only Indian woman boxer to qualify — she hasn’t let go of the opportunity to leave her mark at the Games. It is not often that one gets to meet a superstar – and a sports superstar at that. I had the good fortune of meeting the Magnificent Mary last year when I interviewed her for my forthcoming children’s book by The National Book Trust of India (NBT). This post was part of that interview, which I had published when she had come back from China with a gold medal in the Asian Women’s Boxing Championship at Haikou. She had won the medal under the most trying circumstances a working mother could go through. I am re-posting the updated interview. Do read it to get acquainted with the Sports Supermom! She could easily pass off for a model, with her slim figure and beautiful dimpled smile. Young mothers can take a lesson or two from her on being a mother and a career woman. And what a career! For if you are not familiar with her face, you’d not believe me if I were to swear that she is a boxer. Tough, wiry and determined – that’s MC Mary Kom for you. I met her in March last year, when she had come to Delhi to attend the launch of the Sports Achievers’ Special edition of the Limca Book of Records. She had taken a day off from the training camp at Patiala, where she was training for the Asian Championships. As she talked about her childhood — the poverty, the struggles, her convincing of her parents to let her take up boxing, and her single-minded pursuit of a career in sports thereafter — her slender form belied her strength of character. She had been a teenager when she won the state championships in Manipur and her parents got to know that their daughter was a boxer only when they saw her photographs in the paper! 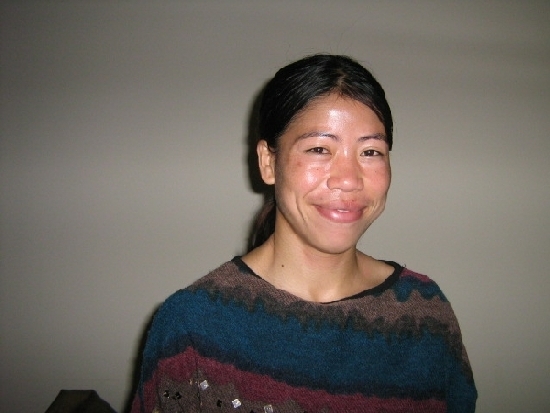 On May 8, 2011, this wonderful woman won the Asian Women’s Boxing gold in the 48 Kg category at Haikou, China. Had I not got a mail from her secretary Jimmy about it, I would have missed the news item completely. Times of India carried a single column news item buried in the last but one page of the paper. There was no picture of the boxer either. The visual media of course had better things to cover and re-telecast ad nauseam. What made this victory special was that she had won the lone gold medal of the tournament and had done it under the most trying personal conditions. Ironically today her photo is splashed across all national and local dailies and the media is screaming itself hoarse over her remarkable performance at the Olympics. When I had called her before she left for Haikou, her husband K.Onler Kom told me that he was in Chandigarh where their little son, K. Khupneivar, was admitted to the PGI with a heart problem and an impending surgery. Mary didn’t want to go for the tournament, but her husband pointed out that he was there with their son and that she had a duty to the nation too. He also told her that she would be back in time for the surgery. The decision to board the plane to Haikou must have been one of the toughest in the boxer’s life, but she did, promising her little son that she would bring back the gold. And she did! Like any other working mother, she misses her children when she has to be away, which is quite often. ‘I keep thinking of them all the time, but feel reassured that my husband is with them,’ she says. A lesser woman would have caved in to the tension and pressure but not Mary. 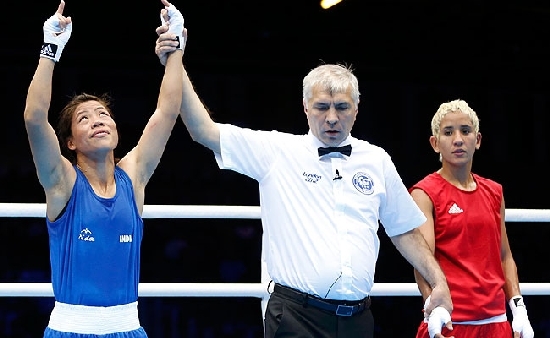 The boxer in her took over the mother once she got into the ring and she defeated the then Asian champion Kim Myong Sim of North Korea 4-3 in the final bout of the 48-kg category, to win the gold. She literally punched her way to glory – for her son. The child had cheered his mother from his hospital bed, watching her on internet. Mary had rushed to the hospital as soon as she landed in India to be with her son on the day of the surgery. The surgery was successful and Mary was one relieved and happy mother that day. If this mother is not a super mom, who is? It was not the first time that she had exhibited such mental fortitude. Way back in 2000, on her way to the selection camp for her first Asian Women’s Boxing Championships, her luggage and documents were stolen. She valiantly carried on, fighting the odds. Though she lost the final bout in that championship, she had proved her mettle and the fact that she is a fighter, not a quitter. Besides winning five consecutive world titles, Mary Kom has four Asian Championship gold medals and 11 national titles to her credit. She is an Arjuna Award winner and has also won Padma Shri and the Rajiv Gandhi Khel Ratna award. One of the protégés of the Olympic Gold Quest, a non-profit organization started by former badminton champion Prakash Padukone and Billiards champion Geet Sethi, Mary has proved herself by making it to the Games this year. With such a long list of achievements to her name, Mary Kom is a superstar, but before the Olympic success, there were many who had not heard of her or recognized her face. Things will change dramatically now, of course, but why was this gorgeous sportswoman not snapped up by advertisers to endorse their products as others were? Is it the fault of the respective associations that such sports get less or no media coverage? Or is it the fault of the public that ignores all other sportspeople except those in the glamour sports of cricket and tennis? ‘Let’s hope the country will take note of women’s boxing after we win medals in the Olympics,’ she said hopefully and with a wide smile. This young woman has traversed the long rocky terrain to world fame from the small tribal village of Kangathei, Moirang Lamkhai in Manipur. And after her Olympic success, hopefully, she will be a household name for years to come. Being a sportswoman is a physical challenge and being a medal-winning sportswoman after becoming a mother is even more of one. And Mary has proved herself on both counts. Here I should mention that her husband Onler Kom has been a pillar of strength to her. She certainly can’t travel so much leaving behind her boys, had he not sacrificed his own career as a footballer to take care of them and leave her free to concentrate on her sport. Behind every successful woman, there is a man, if you ask me. Unless a woman gets the psychological support in addition to the moral and physical one from her husband, she can’t give off her best. Mary does not miss any opportunity to acknowledge her husband’s contribution to her success. Today he is with her in London, the first time that both of them are away from the children. But they are smart enough to understand the importance of their mother to country, even at the tender age of five. Mary is not only committed to her sport, but also is a committed human being. Recently during the economic blockade of her state, she was in the forefront of the relief work, donating food and clothes for the beleaguered populace of Manipur, along with other prominent sports persons from the region, like Bhaichung Bhutia. Let’s salute a supermom and hope that she inspires the youth of the country to take to a career even in unconventional sports like boxing. mera desh mahan… 100 main se 99 baiman, phir bhi mera desh mahan including me. Yes, she is a super mom. I knew a bit about Mary but you have explained clearly how much effort she had taken to come to this stage. Kudos to her husband and kids. Family support is a must for coming up in sports, esp. the not so ordinary sport like boxing. I admire her will power. This is more will power than physical power which had brought her this far. Thank you, Zephyr, for Introducing her to us ‘properly’! I am so sorry, Sridevi. I thought I had replied to this comment. Nice to see you here after a time 🙂 Good though, since I went for the movie day before. It has romanticised her life and changed so many facts. Wonder why it had to be so. The movie was made more for adults I think. If her life has to be an inspiration, the realities have to be emphasised and her strength of character brought out. Read your blog.That’s an inspiring story about Mary Kom’s achievements.She is indeed a super mom, a role model to many aspiring and upcoming sports women. Behind every woman there is a man.Her husband proved it. kudos to this super mom and also to you Zephyr for bringing her to our notice. I never knew about her. Arghh, I typed such a long, emotional comment – drat the internet. Well all I’m going to say is Mary maiya ji jai!! Hats off to the super mom ! Salute. May her tribe increase. Young Indians need to take her way of life to their heart to shine , in whatever they want to do.I am sure she is already an example for all those aspiring for what they desire. And to you, for bringing her to blog readers’ notice, in a sincere way, making us all a part of your feelings for Mary’s triumph! A great post Zepyr. It is a pleasure to meet and write about great people especially those who are so humble after achieving so much. She is training girls especially from the economically weaker sections to which she herself belonged, in her boxing academy in Manipur. We need more like her, for sure. What a wonderful blog about Mary. Every Indian is proud of her achievements. The media is changing, they are focusing their attention to people less known, the change is happening. True, that the media is changing. But the change is too little too late. She has won five world championships and five Asian championships. One reason she couldn’t win at the Olympics could be to do with the change of her weight category from 48 to 51 kgs. All the wins have been in the lower weight category. But her bronze is worth its weight in gold. Thanks a lot for bringing this quiet determined performer to the forefront.I admire the way she has been pursuing her goal even in the face of such neglect. Neglect is the right word. Look at her even now. While others have got cash awards to the tune of one crore, no such reward has been announced for her. She is an invaluable asset for the country. A super article on a super mom by a super writer 🙂 Thanks for reposting it, Zephyr. We need to read more articles like this on our sporting heros rather than the chest thumping article that is the norm. What lavish praise Sudha! I wonder if I can take the credit though. When one writes about a worthy subject, the piece writes itself and hence the reading is pleasant. She is the most humble person I have met. Even after losing yesterday, she apologised to the nation for not getting the gold! That is one inspiring story and Mary Kom is indeed a model – a role model. Thank you for pulling out this old post for us. And yes, her husband deserves a pat on the back for all this support. Her husband deserves a pat for more reason than one because he quit his own career in sports to take care of home and hearth and leave his wife free to pursue hers. And she is indeed a role model of what a woman should be. My salutes too to the Supermom! A wonderful post on the amazing lady..she is an inspiration indeed. You are coming out with a children’s story book? What age group is it meant for? Can my 6 year old daughter read it? Would love to know when you will be coming out with it. Wonderful feat and beautiful tribute! She has given hopes to so many! Thanks Giribala. Indeed she has. And I am sure she will personally lead the training of young girls in the sport. After all, she has been a pioneer and a path-breaker in this unconventional sport. Hey Bikram, I have updated the post! Yeah, she will be our golden girl even with a bronze medal! It is only during the international events that the women sports persons are mentioned by the media….that too only if they have made a mark. It is sad. She has earned the respect of many Indians…kudos to her. It must have been an honor for both of you to meet each other. I am usually at loss for words when I come over to your blog. By her story, we can say that there is man behind most of the successful women? Hats off to her better half who is standing by her. Hmmmm, I am a very talkative person, who can torture people with my blah blahing endlessly. But there are people who deeply touch my heart, and that is when I shut up because I cannot find the right words to match what goes in my heart, though it is damn easy to say what goes in my mind. Ha ha..It is nice to know someone who acknowledges being talkative 🙂 Go ahead and speak your mind and soon you will find words to articulate what is there in your heart too. I am touched that I am included in the list of people who touch your heart. Thank you so much Farida. Such a wonderful post…and Mery Kom is a true inspiration! It was so nice to read about her. I so agree with others here…you must dedicate a category for such outstanding people! There is a category called Tributes, in which I have written about great people on my blog. I am upset at the callousness of the media which is blacking out her medal now that she has lost the semi-finals. Story of our nation, if only all the hero’s are giving due recognition .. It is a famous saying that a nation that forgets its hero’s or does not recognise them will never do goood ..
Go there with all the good wishes of an entire nation. And it never occurred to me that she might fare the same way that other boxers did while facing British opponents. But God is great and she will surely overcome the odds and even biased referees. Fingers crossed and palms folded in prayer. My comments are not showing 😦 Pls. check your spam folder once. Wow! You met her, that is so incredible! Thanks to you, all of us got to meet her too. I have been following her matches closely and its very inspirational to know more about her, her trials and the support that she has received from her family. She is a real hero, made an entire nation proud! Kudos Mary! Go conquer the world! hats of mary.. very inspiring for new mom’s like me, who are struggling to choose between career and staying back home to take care of kids.. yes, both can be done.. it is so nice to hear that u met her personally too.. must have been a “fell good” experience na.. i am wisher her and her family all the luck..
She never fails to point to the unstinting support of her husband. He always stays back with the kids so that she feels tension free to concentrate on her bouts. How many such husbands are there in the world of working women? It becomes a double burden without such support from the family. Of course, this is not to take away from her determination and great sporting talent. I am glad you did it way before anyone actually knew about Mary. She is a supermom indeed. You bet, I am glad 🙂 First a telephonic interview and then a personal one in Delhi. That was so wonderful! Thanks for sharing Mary’s story, Zephyr! It is so very inspiring. Mary is a superwoman and a supermom indeed! I was one of those who had never heard of Mary Kom before this Olympics season. Makes me wonder why. Why was such a brilliant sportswoman and such a wonderful person not splattered all over the media? Sad situation that is. I was very happy to meet her, sure 🙂 But I wonder if I will be able to, what with all the high profile mediapersons making a beeline. No matter, because I will be happier to see her getting her due in terms of publicity and awards 🙂 Let’s all pray that she gets the gold. Amazing story of grit and perseverance…..Mary is truly inspirational…. I read a tweet somewhere – I asked my daughter to sit and watch her match so that she knows how a woman is supposed to be. She is a true hero and irrespective of what she brings back from Olympics, she will always be a hero. She is the most feminine of them all, despite the sport she is in. So gentle and yet so determined with such steely resolve. But what touched me is her faith — in God, herself and her family and loved ones. Those keep her going, I am sure. What a heart-warming refresher! Hope it turns into a golden smile. While I am abstaining from everything Olympic, I’m sure I will be watching out for the shimmering rays from the corners of my eyes. Zephyr, thanks for bringing the unsung heroine who is now in limelight, on the forefront! This is the true power of ONE! !Women do not bring dowry but bring GOLD and she is one gem we must feel proud of! Zephr, as always, your posts continue to charm me, and keep me enthralled. I have been following up on Mary over the past one year, and reading your post, has only strengthened my understanding of her as a very real, down to earth and focussed woman, who has overcome all odds, to be where she is today. And, I do believe, she will scale even greater heights. It’s what is due to her. Incidentally, manipur is one state that actively supports sport. I had been to imphal some time ago and was flabbergasted to see a state of the art, Asian sized sports complex, complete with facilities for every kind of sport. And then, there is the capital. Sad in it’s poverty, really sad….but the people, a more patient and hospitable group, I have not encountered. Unfortunately, the ultra movement has kept this beautiful state isolated from the rest of the country, and an indifferent centre, does nothing to alleviate the miseries of it’s people there. All the very best to Mary! She is an example of how only being focussed can bring in the results, even when no one is paying attention to you. She has been banking on her Olympic success to make people sit up and take notice and my heart had stopped when she failed to qualify for the Games earlier this year. But God was on her side and she managed to go to London. Now to bring back that gold! While watching Mary Kom’s recent Olympic triumphs, I remembered this post you wrote last year. Nice to read this updated version! Yes, she’s a Super-mom and an exceptional person in so many ways! Just hoping she makes it. Every damn little thing gets publicity in our country except those who deserve and needs to. I agree with Bhavana. 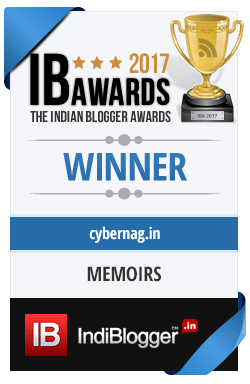 Good that you could meet her before the media madness begins…:) super post about a super mom by a super writer..:) hats off to our hero! Yes unsung heroes, ya heroines are taking up positions from where they are going to demand attention. I am glad you liked the post Prasanna. She will indeed demand and surely get all the attention that has been denied her all these years as she has struggled to make it. Let us all pray for her gold! I am sure she will remain the same simple girl that she was when I met her even after all this limelight. Imagine being five times world champion and five times Asian champion and still be unheard of by so many! Really sad state of affairs for all other sports than cricket. such a wonderful post Zephyr!! isn’t she supercool? we rely heavily on print and electronic media to get acquainted with such phenomenal personalities but the less we talk about media the better it is. Electronic media will publicise anyone that they think will increase their TRPs and newspapers are even worse. But after this Olympics she will become a household name and there will be many young girls donning the gloves and getting into the ring. If she brings the gold, then sky is the limit for the sport. But only if the government took cognizance of it and the advertisers get her to endorse their products. Such a heart-warming read, Zephyr. I agree with Purba. A series would be just wonderful – or would you rather turn it into a book? 🙂 Either way, would love to read it. Knowing how ‘fast’ any government body works, I won’t be able to give any specific date 🙂 I have already submitted the manuscript and the illustrations are being done. Keeping fingers crossed. What would have happened if Women’s boxing was not introduced this year at the Olympics? Maybe I would not have come across this wonderful person at all! It’s great that she is winning a medal in this Olympics. Imagine going through so many years as a champion, known only in North-East! This lack of coverage is definitely a fault of the Indian media. She deserves the Olympics gold medal more than all other sports-people. I wish Gold for her. She shared her childhood struggles, the lack of money to buy her gear, the daily grind her parents went through for the children’s education — all in a matter-of-fact way, without any bitterness. She is a fighter and has great faith in God. She deserves to win a gold. A million salutes to the super achiever and her supportive husband. All the very best for the health of her sons. The way we studiously ignore such people in their days of struggle and initial days of achievement and, thereafter, lionize them when they manage to climb the pinnacle is a shame. How can we attempt to shine in their reflected glory as fellow-Indians when India as a nation contributed scant little to their achievements? Nice reading this. I have been following her but got to know so much more and great to read about such a man behind this wonderful successful woman too. Thanks for sharing. Oh yes. Is that a book which we can buy, or is it an article somewhere? Sheer Inspiration thats all I can say!!! Yes, she is indeed. Already a host of girls are training in her boxing academy in Manipur. She will train many more Marys for sure. I was watching her interview after her bout, and I loved her spirit and frank answers. I love her and wish her the best. Sooner or later, everyone sits up and takes note. I am sure, true heroes will find their way through. That said, we all know the sad shape of news and reporting in this country. I am so looking forward to finding that book of yours. I am looking out for her and the other boxer Laishram tonight. I also adore P Kashyap, Vijay Kumar and Saina. Saina is a role model of a wonderful young Indian woman, filled with grit and determination and so humble! I hope more kids are inspired by people like these! Look who had written about the hero everyone is going to sing praises about for the next four years! She trained her eyes on the Olympics and there she is for all to see and finally appreciate. Thanks for sharing her story. Very inspiring. She is very sincere and hard working too. Oh!I’m so proud of her.A true Indian,a super mom,rolled into one.It would’ve been a shame not to know her story.. Thank you Akka for sharing this with us. And the fact that she is from Manipur makes it even more heart warming, the politicians and the media have time and again not shown favours to sportspersona from north east while Shakshi Dhoni’s wearing jeans make news.. I would say that coming from a very underprivileged background and yet making it in international sports is more heartwarming than her geographical origins. She is an inspiration to an entire generation of youngsters. Its disgusting how Kaskar and Gabriela are being covered by the media and heroines worth their weight in gold are being buried in 1 x 1 columns in the ‘last but one page’. Brilliant post, Zephyr! God bless her and her son and you! Only here it is more like a single father 😀 But why single mother? Even when she is with her husband most women end up doing more work than him. but Mary is lucky to have such a wonderful husband to support her efforts to bring glory to the country. Amazing woman. Thanks for posting Mami. Amazing story and yes i read about her and have known her exploits – thank God for my need to read till the cows come home. What an amazing thing that you get to meet her – odds or not, a Asian Champion and World champion is not easy deal. That she has kids and family to take care of makes her even better. My wishes for her success and thanks for sharing. I am really lucky to meet such achievers. I will be writing about others too from time to time. amazing story! my respected salutations to this achiever! Besides saluting this ‘supermom’ I would also like to salute her ‘super family’ for the kind of support they provide her to pursue her career. A special salute and a big thanks to her husband. Rightly said Pratibha. Her husband deserves more applause than her. Wonderful post! Mary Kom’s career is an inspiration to any young woman today. She has certainly done India proud! I love it when you dedicate posts to unsung heroes. How else do we get to read about them. Newspapers will rather focus on why Kareena chickened out from endorsing a chicken brand. Why don’t your start a separate series? why, that’s a wonderful suggestion. I think I will too. Thanks Purba. What is sad is that she is no less glamorous than Kareena and a morel naturally beautiful and if all the papers want is glamour, they can still feature her for that alone if not her sporting prowesses! Unsung isn’t it? But then our media does not have time for sports other than cricket and sometimes tennis. Pursuing lesser known sports in our country is tough and that too being a mother is doubly so. You said it right she could do so bcoz her husband stood behind her. She deserves more media coverage for the simple fact that she has inspired an entire generation of girls to take up boxing. And a girl couldn’t find it any harder than Mary did. All she possessed were determination and grit.